A quick search of the web led me to the massive eGullet thread on sous vide cooking. While the thread contains a treasure-trove of practical information — especially Nathan Myhrvold’s posts — it left me with a lot of unanswered questions. Being an academic, I turned to the scientific literature for answers; as expected, I found many answers and many more questions. ML: Your excellent sous vide resource, “A Practical Guide to Sous Vide Cooking” has a wealth of information. What drove you to write this article? And have you ever considered publishing it in a peer reviewed journal? DB: Thank you. I’m very glad to hear you find my guide to be useful. As a scientist, I am driven by two things: an insatiable curiosity to learn everything I can about a topic and the desire to freely share what I have learned with the world (so others can extend and build on what I have done). After spending hundreds of hours researching sous vide cooking and discovering how much of the information online was incorrect (and potentially dangerous), I felt compelled to write up what I had learned and post it as soon as possible. I am still actively working on my guide, and hope to complete another major revision in February. I have not submitted my guide to a peer reviewed journal because its intended audience is chefs and foodies. Though I did ask a number of food scientists to review my guide for technical accuracy, and I was recently asked to referee a paper for the Journal of Food Science. ML: From your viewpoint, what is the biggest advantage of sous vide over conventional cooking? DB: Control. Precise temperature control gives incredible choice over the doneness and texture of meat, poultry and fish. Tough cuts can be made tender. Tender cuts are the same perfect doneness from edge-to-edge. Fish and light meat are moist and flavorful. Pork and poultry no longer needs to be brined to be juicy (because they can be made safe without being cooked well-done). ML: Do you think sous vide cooking will ever become so common that the equipment will be available in regular kitchen stores? And if yes – when will that be? DB: I don’t think sous vide cooking will ever be so common that immersion circulators will be sold next to microwave ovens. But I fully expect them to be as common as smokers in 5–10 years. Like smoking, sous vide cooking requires a little knowledge and planning — an easy request of the average Khymos reader, but a lot to ask of most consumers. This is unfortunate, because I find sous vide cooking to be convenient, energy efficient, and versatile. ML: What kind of equipment are you using yourself at home for sous vide? And how often do you typically cook sous vide? DB: I use a Minipack-torre MVS31 chamber vacuum sealer and a PolyScience 7306C immersion circulator for most of my sous vide cooking. I usually attach the immersion circulator to a full-size countertop food warmer with a lexan lid I made — the lid limits evaporative cooling and the food warmer speeds the (initial) heating of the water and limits heat loss from the bottom and sides of the water bath. I also have a couple Iwatani butane blowtorches, a used PolyScience immersion circulator, a couple PID controllers from Auber Instruments, a Ranco ETC temperature controller, a FoodSaver vacuum sealer, and a bunch of thermocouples and meters from ThermoWorks. I eat food cooked sous vide almost everyday. As a single guy, I batch cook most my meat in single servings pouches, rapidly chill and then freeze them until needed. While this `cook-freeze’ sous vide is very convenient, the freezing and reheating of the meat does causes small, but noticeable, degradation in taste and texture. ML: Have you compared DIY bagging with zip-lock bags, food saver bags and vacuum chamber packs? I know that liquids are challenging with the food saver, but does the bagging method affect flavor (or even texture)? Does the small amount of oxygen in the DIY version have any effect? DB: For meat, different bagging methods have little or no effect on flavor and texture. The primary purpose of bagging is to allow the efficient transfer of heat from the water (or steam) to the food (while still keeping the food and water separated). Sealing the food in a bag has the added benefit of preventing evaporative losses of flavor volatiles and moisture. Even when using a chamber vacuum sealer, the majority of bags have high levels of residual oxygen. The main difference between using a zip-lock bag and a chamber vacuum sealer is the extent to which the bags balloon when heated; (when heated over about 65C/150F) both bags will start to balloon because of the vapor pressure of the liquid in the bag, but the zip-lock bag will balloon more because the residual air in the bag will also expand. It is important that the food is kept from floating to the surface of the water to prevent uneven heating. While meat can easily be cooked in a zip-lock or food saver bag, fruit and vegetable compression requires a chamber vacuum sealer. Moreover, zip-lock and food saver bagged vegetables balloon excessively in the 85C/185F water bath they are (typically) cooked in because it very difficult to remove all the air in the bag. ML: What are your favorites cuts of meat for sous vide? DB: With the faltering global economy in mind, I love showing off sous vide cooking’s ability to transform inexpensive cuts of meat into something amazing. Consider the humble chuck roast, a flavorful cut of beef which is usually relegated to stews and hamburger because of its abundant connective tissue. Vacuum sealing, cooking for 24 hours at 55C/131F, and searing to a beautiful mahogany color transforms this humble cut into something akin to prime-rib! Pork shoulder vacuum sealed with lard and cooked for 24 hours at 68C/155C, torn into bite-sized hunks and fried in a little oil is always a hit at my dinner parties. Even the the lowly chicken breast can be made into something moist and flavorful by pasteurized in a 60C/140F water bath (see my guide for pasteurization times). ML: Is there any meat that you would prefer not to cook sous vide? DB: I don’t like some types of fish cooked sous vide. When cooked too slowly, the enzymes in the fish remain active and cause the flesh to become mushy. 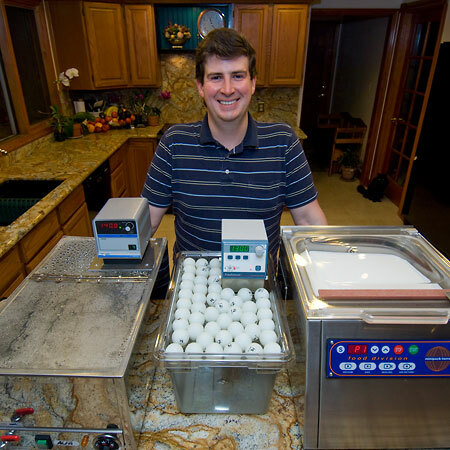 [This can be mitigated by using a water bath temperature 5–10C/10–20F higher than the desired final core temperature and using a needle temperature probe inserted through closed-cell foam tape to determine when the fish is done heating.] Also, fish which is not extremely fresh will taste too fishy because the flavor volatiles remain sealed in the bag with the fish —this is a particularly irksome problem for me in land-locked Colorado. ML: Some critics claim that with sous vide, even though you brown the surface, you loose some flavor since temperature is kept so low (I believe this applies especially for pork). Do you share this experience? DB: It is a very reasonable concern, but can be mitigated by quickly searing the meat before vacuum sealing and cooking. While the initial Maillard reaction occurs noticeably above 150–180C/300–350F, many of the subsequent reactions can occur at the low temperatures used in sous vide cooking. Personally, I feel searing after cooking is sufficient and almost never take the time to pre-sear my meat. ML: From your experience, what is most difficult to achieve when cooking sous vide? DB: A great sear without overcooking the meat. While a blowtorch works wonders on beef and (most) pork, it tends to burn poultry. A pan with a little oil over medium heat (so the oil is between 150–180C/300–350F) works fairly well for poultry, but may overcook the meat before the surface is golden brown. ML: With Keller’s recent book “Under pressure” and your guide (and an extremely long thread at eGullet) being available now: Which areas would you say need further exploration? DB: Sous vide cooking is still relatively young and there are hundreds of interesting questions yet to be answered! Some of the questions I’m currently interested in are: How long does it take all the soluble collagen to unfold into gelatin at 55–65C/130F–150F? What is the role of enzymes when cooking at low temperatures for long times? Is it better to thaw the meat or cook it from frozen? If cooking from frozen, how long does it take to heat a piece of meat (such as foie gras) stored at -80C/-110F? Which foods can be frozen or refrigerated after cooking (and for how long?) without significantly degrading taste or texture? How and why should fruits and vegetables be cooked sous vide? Why does fish retain so many more of their essential fatty acids when cooked sous vide (compared with conventional cooking methods)? . . . In addition to the many unanswered questions, there are also many topics which are understood but have yet to be discussed in sufficient detail. For example, many people’s intuition about clamp and chamber vacuum sealers is wrong. The importance of food shape in predicting heating times has not been discussed — spherical and cylindrical foods heat much faster than slab shaped food. The relatively fast onset of warmed-over-flavor after the food is removed from its vacuum pouch is absent. And even how large and powerful the water bath needs to be for a given quantity of food has not been discussed. Hopefully I, Nathan Myhrvold, or someone else will have the time and resources to answer all these interesting questions. ML: Thank you very much! This is an awesome review (and photo) of some really technical applications and experimentation with sous vide cooking – which of course is generally required to do it well. Would there be any advantage to sous vide cooking non-meat (read: vegan) products? But there are other compounds, like lignin and so forth that can make some vegetable tough. Has anyone tried celery? Would sous vide make it less stringy? How about sous-viding (sp?) a potato to make a better ‘baked’ potato? I’m sure there are other experiments. Just wondering. Nessie: While sous vide has primarily been applied to meat, many of its advantages should also apply to vegetables, fruits and legumes. For instance, studies have shown that vegetables cooked sous vide retain a much higher percentage of their nutrients than vegetables which have been boiled or steamed. At the industrial level, potatoes and legumes are now frequently cooked sous vide. This is certainly something I’m interested in and I will hopefully have a detailed section on vegetables and legumes in a future revision of my guide. Claes: I’m afraid the equations in my guide do not have a simple solution which I can give you. Indeed, all the times in my guide are computed using sophisticated numerical algorithms. But, I do plan to include expanded (and hopefully easier to use) tables in the next revision of my guide. Thanks for this interesting post! I am a dutch chemistry student, and I have recently acquired an used immersion circulator. I can’t wait to see it in ‘action’. I just hope the temperature control is still working. Although, 30 euros is not that big a loss. Anyway, I’m researching sous-vide now, and thanks to the here provided “A Practical Guide to Sous Vide Cooking” link things have become more clearer in a scientific way. The lignin question is an interesting one (regarding celery). I’m also a woodworker, and we have to deal with lignin whenever we need to steam bend a piece of wood. It takes some very high temperature to do that: after all, the wood has to be steamed. Lignin though, once cooled, becomes rigid again. Not at the same shape, and after the initial heating, you can’t do it again. I’m not sure how it applies to cooking, but for woodworking, you only get one shot at it. A great thread and an enjoyable read!! I am just beginning my journey in sersious cooking and am currently searching for an immersion circulator so I can begin to explore the wonders of sous-vide cooking. Wonderful, thanks for a great post. Ideas in food recently posted about sous-vide cooking aspargus with good result. They also promise a coming popsci article on the topic. BTW, I would have liked to rephrase one of Martin’s questions a little bit, since sous-vide thinking is maybe even more important than the equipment. In my head, Martin has already proved this point (in-the-head rather than in-the-gear) in his DIY sous-vide post from January 2007. Temperature tables for different sorts of meat have been in the cookbooks for several decades now, but in my eyes the general public owning and using these books haven’t really taken this point seriously (enough). Of course, there is much more to it than having one temperature for beef, one for veal, one for lamb etc. as many cookbooks state, but it might be wise to differentiate between the professional chef/food geek and the general public (slow-cooked meat is of course no new phenomenon, my grandma does it as well, although not with a scientific basis of her practice). Maybe no surprise that my agenda is in education, but I think the field has a great potential also for the general public. Maybe we need to adjust our way of communicating when we talk to the everyday guy in the street compared to the foodie. Maybe he would grasp this as something more than entertainment by professional chefs on the TV. Erik, you question is certainly appropriate. But I do in fact imagine a sous vide machine with a built in algorithm based on the data collected by Douglas (and Nathan M.) where you only plot what type of meat you’re using, how much and then hit the start button. I don’t know if something like this will ever be built, but it would certainly be quite cool! Regarding temperature tables – yes they’ve been around for a while, but are they correct? Do they really reflect the current understanding? Aren’t many of the temperature a little to high based on previous assumptions regarding safety? Very nice article! Baldwin has created a truly useful resource and I am grateful for his research. Cryovac makes a bewildering array of bags. Which model(s) are recommended for sous vide? I’m using a somewhat non-standard method of vacuum packing. I use a thermal impulse sealer to seal the food in a bag (liquids must be frozen). I have a vacuum pump that goes to 7 torr with a silicon tube attached. After I clip a corner of the sealed bag, I insert the tube, pull vacuum, and then re-seal with the implulse sealer. I did fillet mignon sous vide a couple of weeks ago. 3cm steaks cooked at 57 degrees C for 2 hours until the middle was 53 degrees C. They were then seared on a custom (heavy) grill on a big green egg at 600 degrees F (sorry for mixing units). Best steak I have ever made! Martin’s DIY Sous-vide Perfect steak sucked me in. Douglas’s was the only real information on how to and recipes for sous-vide in one spot that I could find on the net – yes Martin and Chad share items but their context is a much wider discussion. I am eternally grateful to Douglas for his selflessness. Subsequently I bought the Roca book and the Keller “under pressure” book. The former is great if you are in the industry, the latter is a gold mine and has augmented Douglas’s resource. We sous-vide with most of our cooking here in Australia. We tried laboratory accurate temperature cook tops but settled on a polyscience thermal immersion circulator. The recipes we started with we have expanded, adapted and multiplied. The limitations of a food saver sealer can be got around. If the item to be poached is damp or covered in liquid (marinated), wrap the item to be cooked in plastic food wrap before putting in the food saver, otherwise liquids must be frozen. I love truffle oil infused sous-vide chips that are twice cooked. Sous-vide poach the batons. freeze and then deep fry (Thanks Chad). The salmon recipe in Douglas’s resource really is divine. And if you use the food pairing site from Belgium as Martin recommends, stunning tastes are only limited by your imagination and budget. I salute and thank Martin, Chad and Douglas as visionary sharers. i must say – great! Good research – as a beginner of professional cooking all these information are really helpful – thanks! Great information. It brought back memories over 25 years ago when I was involved with introducing a very new technology to the U.S.; sous vide. It was used extensively throughout Europe….however not well known in the U.S. It has revolutionized the introduction of high end quality food prepared and table ready in nearly any setting or use. I would like to have your feedback regarding this component of time. Let’s say Iam having a dinner party and I cook this beef steak for 45 mins at 60 degrees celcius….At this time, it should be medium rare…But my guests are not ready yet to eat…How long can I hold at 60 degrees be it becomes well done or it wont be well done for another few hours? Douglas, I see from the above photo you have the PolyScience 7306C circulator now. Previously you were using the SousVide Supreme in the embedded videos of your on-line guide. Can you describe the advantages of the more expensive 7306C circulator? What sort of foods benefit from using the 7306C circulator over the Supreme? Is the metal shelf of the Supreme necessary when using the PolyScience circulator? Is the food grade plastic (the one with the ping pong balls) bin double walled or relatively slow at heat loss? I’m toying with using a stainless stockpot vs. purchasing a plastic bin with lid. How often should one change the water? Every day? week? never? (i’d be afraid of growing pond scum if I went with the last one). I read that alcohol reacts differently in vacuumed bags (because the volatiles cannot escape). Are there general rules about using/not using wine in recipes before (as opposed to after) sous vide cooking? Any updates about plastic bag safety with sous vide? I know that PVC containing plastic is to be avoided with sous vide. I read that Harold McGee thinks food-grade plastic bags (which ones?!) are probably safe at sous vide temperatures (below boiling). But what is the effect of vacuum pressure, especially if we spring for the expensive and powerful chamber vacuums? My concern: Glad, for instance, states their ziplock bags do not contain any PVC, but they do not recommend them for sous vide; however Glad declines to explain why. Are there known/unknown pasticizers we should worry about? Are food safe plastic bags, which are not reusable, biodegradable? What if sous vide were a smashing success is its reliance on plastic bags a potential reason to avoid the method, especially if we are approaching/entering supposedly “peak oil” times?